The area around subway Kyoto Shiyakusho-mae Station is a bit far from Kyoto Station, but in this area you can find many new and hip stores and restaurants. One of them is Antonio, offering Spanish cuisine. The restaurant opened in 2003, and has such Spanish classics on its menu as paella. Their tapas menu is also extensive, and they have a nice selection of Spanish wines. Foodies are sure to be satisfied, and so are oenophiles. The clean interior, beautiful paintins reminiscent of Spain, all make the restaurant feel nicely out of place, like you were not in Kyoto anymore. Plus, the staff can speak English and Spanish! The seafood extract used on the rice makes this dish burst with umami. The rich taste and flavors of this dish are, oh, so great it makes you feel like you were back in Barcelona sipping some red wine as the sun is setting. There is some lemon on it too, giving it a nice zest. It takes some time to cook this dish so don’t hesitate on ordering it. The plump shrimp are served to you simmering, so be sure to eat them while they are hot. They are cooked with white wine and olive oil so the garlic is not overpowering. After eating the shrimp, be sure to dip some bread in the leftover sauce. It’s one of their popular tapas. Since it is served rather quickly, it’s perfect to snack with an alcoholic beverage. The distinctive flavors of the dish are the fresh aroma of the olive oil and sourness of the vinegar sauce. It’s not fishy at all because of how fresh the anchovies are. It goes well with not only beer and wine, but also sweet sangria. Chilindron is a Spanish regional dish in which meat, onions, tomatoes are simmered. At Antonio, it is cooked with lamb, which is often consumed in Spain. Dip the lamb meat in the sauce in which the umami tastes of the vegetables is condensed, and then eat it. The aroma of thyme adds an accent and it will stimulate your appetite. Have it with red wine. They have menus written in Japanese and Spanish. 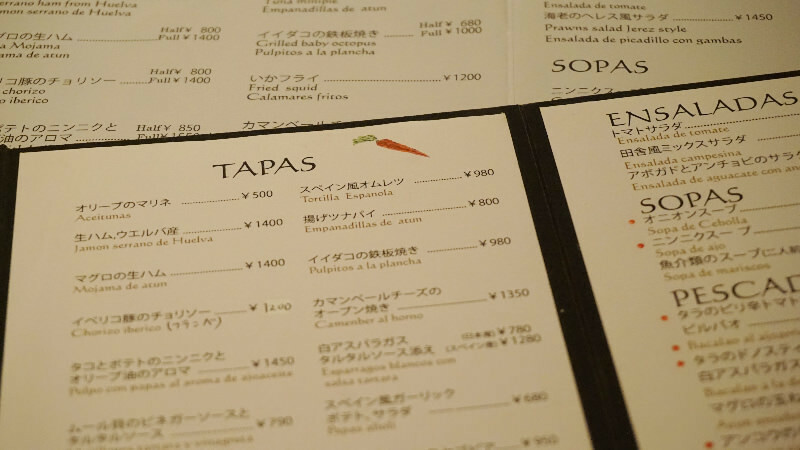 Although an English version of the menu is available, the details and prices of the dishes are not updated and they differ from the current details and prices. However, the staff can speak Japanese, Spanish, and English, so it may be a good idea to ask any questions you have when you place your order. ・There are various kinds of paella besides the Seafood paella. Also, since they serve you a generous amount, you may also bring home the leftovers if you become full. ・A table charge of ¥500 is charged per person, and bread and aioli sauce (garlic mayo) are served. ¥250 will be charged for seconds of aioli sauce. At ANTONIO, you will enjoy cuisine from various areas in Spain. Some dishes may not be familiar, but please take the opportunity to try them. Numerous dishes are available, including rustic dishes and dark-flavored dishes that go well with wine. Selecting dishes from the menu is really exciting. Also, their homemade bread is very delicious! Please dip the bread in the leftover sauce on the plate and eat it. 4-minute walk from Subway Tozai Line Kyoto Shiyakusho-mae Stn. 5-minute walk from Subway Karasuma Line Karasuma Oike Stn. 5pm - 10pm (L.O.) *During lunchtime, it is only open for reserved parties. Business hours are from 11:30 a.m. to 2:30 p.m.
VISA, MASTER, JCB, AMEX, Diners, etc. / 5% handling charges occur when paying with a credit card. The chef and staff can speak English and Spanish. They will kindly answer even small questions. English, Spanish *Note that the English version of the menu is not up to date.